Thirty-seven lbs. 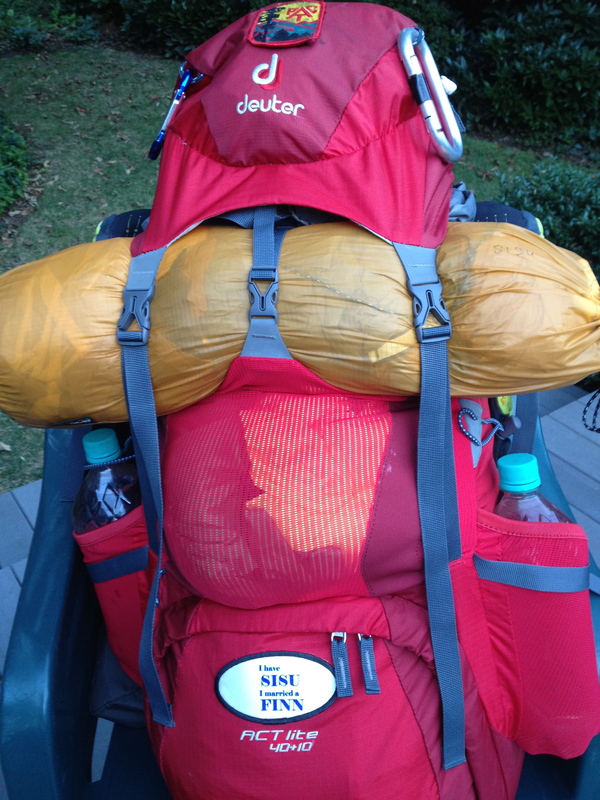 in a 40 liter pack – ugh! Visions of history’s great force marches gnawed at my mind as I set out on my last training hike. This hike was deliberately designed to test my limits. I constantly reminded myself that my efforts and challenges were a cakewalk in comparison to the distances both armies frequently marched during the Civil War on some of the very ground upon which I was walking. The suffering and horror of Bataan or Napoleon’s retreat from Russia were beyond imagination or reasonable comparison. In this context, my hike was easy. Why, I pondered, do so many people physically succumb and drop out of their thru hike attempts? I learned some about why that happens and would like to share it with you. The test I created was a simple worse case scenario. I would hike 160 miles in two weeks carrying my full winter kit and 14 days worth of food. While knowing resupply was easy, I chose to be self-contained and heavy on purpose, just to learn how my body would handle the stress of the extra weight. In the beginning by total pack weight was 37 lbs. That wasn’t a monkey on my back, it was a full grown gorilla! Jane Goodall would have been proud. As I ate the weight down I expected some relief, but Mother Nature had other malevolent ideas. I ate weight, but Momma Nature countered by turning up the heat. As I basted in my own sweat, my mind played games with my head. I obsessed about and deeply resented the useless weight imposed by my winter base layer, the 20 degree sleeping bag and the now useless puffy down jacket. My clothing bag came to weigh as much as a black smith’s anvil. Thank heaven there were no hiker boxes around tempting me to off-load a little superfluous mass. As it was, I pushed to finish one day early in order to beat a tropical storm. Doing that involved three consecutive 15s and one 20-mile day in 88 – 90 degree temps. Good training for summer weather I thought – fortunately minus most of the blood sucking insects. The good news is that the time spent pushing myself to near nausea in the weight room with my trainers at Fitness Together paid off in spades. This hike was harder than imagined, but thanks to my weight training and running, strength and endurance were never issues. In fact, I was able to keep pushing hard at the end of several painful and frustrating days. Age-imposed limitations are the bad news. After it was over, three full days elapsed before I could even contemplate resuming hiking. The message there is that I essentially gained nothing by force marching for 13 days. Zero mileage days actually gain time in the future. Today, one week after finishing, my knees are still sore. The extra weight in my pack conspired with rocky downhill slopes to impose maximum stress on them. Trekking poles helped some, but not enough. I vowed that my total pack weight will never exceed 25 lbs. again, no matter what, when or why. As the hike wore on, small aches and pains asserted themselves. My calves wanted to cramp no matter how much I drank. A muscle in the middle of my back decided to go on strike. My triceps got sore from pushing and lifting myself up with my poles. My glutes staged 60s-style protests. I developed a stiff neck from sleeping the wrong way. Joy was everywhere. The object lesson is that a zero (rest day) about every fifth day would be optimal. Zeroing at least once every seven days is mandatory for me. Otherwise, my body will start rapidly breaking down. Good to know now while there is still time to plan before the main event begins. Without the extra fitness level, I would have been screwed. It is good to know, however, that I am able to push as hard, far and fast as necessary if need be. It’s not too late for anyone hiking in 2014 to get in better shape. Training hikes help, but weight training, boot camp fitness or cross fit under the supervision of a coach/personal trainer can impressively improve your odds of success. Think of it as insurance. The reason I suggest coaching, if you can afford the investment, is that most folks profit from the expertise they offer and their ability to maximize the benefit of your workouts. For months mine have been specifically designed for hiking and they paid off. For example, box jumps with weights are perfect training for high-stepping up stone steps and over ledges or big boulders. And now some breaking news. Plans have changed for my next training hike. Roadrunners often train on the same course upon which they will race to gain familiarity. I’m hoping this rule of thumb applies to hiking. On October 25th class of ’14 member Mary “Hey Man!” Manley and I will begin hiking the 165 miles from Springer Mountain, Georgia to Fontana Village, North Carolina. She’s a recently retired nurse. We’ll travel at her pace and on her schedule. After reviewing “Baltimore Jack’s” notes, I think about five days worth of grub is the most I’ll ever need on this stretch. Not sure how it will go, but we’ll let you know how two retired folks do and will share what we learn from our individual age, gender and hiker perspectives. You can follow Mary’s blog on WordPress and Trail Journals. Enjoying your blog…I’ve run into some leg cramping on occasion, too, and it turns out to be an electrolyte imbalanced induced too much walking in too much heat. Water, even lots of it can’t restore this and now I carry a small canister of Cytomax in my backpack. It really works – for me.